Gu Jianping, 48, has spent the past 28 years caring for elephants, pandas, zebras, ibex and other animals at Shanghai Zoo. "They are just like my own sons and daughters, and each of them is very important to me," she said. Fifty-five of the 150 zookeepers at Shanghai Zoo are women. Often they are assigned less dangerous animals, like birds and amphibious reptiles. "Animals that are timid prefer female keepers, while male keepers are better with fiercer creatures," said Gu, who is among the few female zookeepers caring big and dangerous animals. Her current "clients" may not be particularly ferocious, but many of them are large. She is in charge of five red pandas, two giant anteaters and one maned wolf. Just preparing their meals is a complicated business. The menu for anteaters goes beyond ants. Gu prepares a feed of milk, eggs, grapes, apples, bananas, honey, kiwifruit, yoghurt, dried shrimp meat and vitamin tablets. She even peels the grapes and removes the seeds, and grinds fruit slices into a paste because anteaters have no teeth. It takes her nearly half an hour to prepare feed for just one animal. "Being observant, careful and patient are the most important traits of a good zookeeper," Gu said, noting that even the size of window cracks have to be monitored for temperature control. She arrives at the zoo at 7:30am. First task: examine the feces of the maned wolf. Task two: check the environment of the red pandas. Third: see if the anteaters are awake. "We observe the volume, color and shape of animal feces to look for signs of diarrhea or parasites," Gu said. When animals do get sick, Gu worries like a mother. She lives on Hami Road, near the zoo, and often returns to facility after dinner just to check on a sick animal's condition. Veterinarians are called out in emergencies. Gu started working at the zoo when she was 20. She applied for the job because it sounded interesting, she said. Along the way, she has learned much about animal science. "I am more careful taking care of animals than even my own child because they can't speak," she said. "I need to observe every slight change in their behavior. I read their body language. They tell me what they need through their eyes and behavior." Taking care of pandas is among the most demanding of Gu's work. In summer, she ushers them out into the open air at 6am, when the weather is cooler and more bearable for the animals. She flicks on the air conditioning in their enclosure so that it's cool when they return inside after two hours. It's hard not to form a special bond with animals cared for over many years. Gu was heartbroken when Chuan Chuan, a giant panda she tended for 15 years, died in 2010 at the age of 30. Chuan Chuan used to hug Gu when she appeared every morning. But as an old giant panda, he was suffering from senility and organ deterioration in his later years. His appetite diminished, and he couldn't chew bamboo leaves because of poor teeth. Gu would slice steamed cornbread and apples into thin pieces, and pick the freshest, most tender bamboo leaves for the panda. Then she fed him, piece by piece, which could take hours. "When he died, I cried for many days," Gu said, wiping a tear from her eye. "I miss him very much." Gu gives nicknames to animals in her care. One red panda is called Da Bai, or Baymax, an inflatable robot in "Big Hero 6," because of his mild temperament. The wolf is called Lao Gan, or Old Liver, because his liver isn't very healthy. Zookeepers learn to recognize each animal, no matter how similar they look, based on their behavior and features, Gu said. 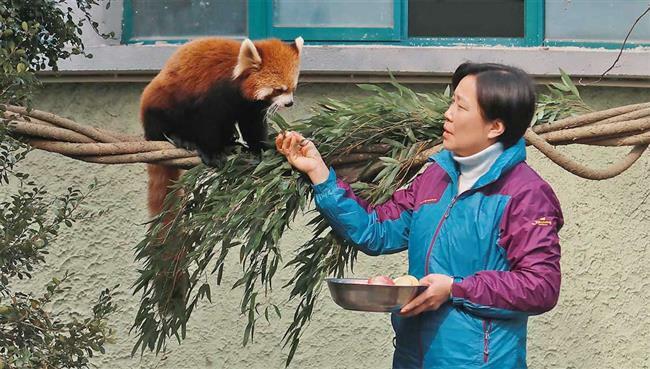 "You You, a red panda, is very nimble and is in a rebellious period, while female Cheng Cheng does not like to move about much and prefers to rest in the trees," said Gu. Gu chats with the animals as if they were neighborhood friends. As panda Pang Pang watched Gu wiping clean the glass of her enclosure, she nattered away in Shanghai dialect, asking her how her apples tasted that day and what she's thinking about. "It may sound ridiculous, but I believe the animals sometimes understand what I am saying," Gu said. "The facial expression of animals is very rich. They smile and they show fear. Through careful observation, I know all their joy, sorrow and anger." It took Gu two months to establish trust with the red pandas when they first arrived. At first, they hid in a corner when she appeared. Now, when she calls them, they come quickly. "The way you treat animals is the way they treat you," she explained. The arrival of the South American giant anteaters last year required staff to learn about an animal the zoo had never raised in the past. The animals were nicknamed Lai Lai and Fu Fu, meaning "good luck is coming" in Chinese. "When they first arrived, they feared us, and we were also afraid of them because we had never seen such animals before," Gu said. "Now, they are very friendly with me." Support from family has enabled Gu to handle her career so ably. Her husband, who does a lot of the housework, understands when she's too tired to talk or go out after a strenuous day at work. In two years, Gu will retire, but that won't end her trips to the zoo. She said she plans to visit every day, and may even plan a trip to the Ya'an Giant Panda Reserve in Sichuan Province to visit two giant pandas there that she once raised. Gu Jianping has worked at Shanghai Zoo for 28 years, looking after elephants, pandas, zebras and treating them "as one of her own."